Roughly six-in-ten black STEM workers (62%) say they have experienced any of eight specific forms of racial or ethnic discrimination at work, from earning less than a coworker who performed the same job to experiencing repeated, small slights at work. That compares with 44% of Asians, 42% of Hispanics and just 13% of whites in STEM jobs, according to the survey, which was conducted in the summer of 2017. One of the most common forms of race-related discrimination reported in STEM fields is being treated as not competent. Among STEM employees, 45% of blacks say they have had this experience because of their race or ethnicity, compared with smaller shares of Hispanics (23%), Asians (20%) or whites (3%). Black STEM workers also hold less positive views of how blacks are treated where they work. 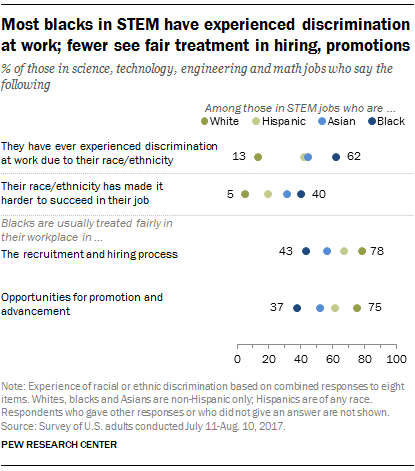 For example, roughly three-quarters of whites working in STEM fields say blacks at their workplace are usually treated fairly in recruitment and hiring as well as in opportunities for promotions and advancement, but those respective shares decline to around four-in-ten each among black STEM workers. In an interview with Pew Research Center, Shirley Malcom, director of education and human resources programs at the American Association for the Advancement of Science, said many of the same experiences she researched four decades ago are still being described today. A study she co-authored about race and gender diversity in 1976 found that some blacks in STEM reported feeling isolated because of their racial or ethnic background – a view expressed by around three-in-ten black STEM workers (29%) in Pew Research Center’s new survey. Although today’s STEM workforce is more racially and ethnically diverse than it was 25 years ago, blacks and Hispanics remain underrepresented in the field. Blacks and Hispanics made up 27% of the total U.S. workforce in 2016, but only accounted for 16% of those working in STEM jobs, according to a Pew Research Center analysis of the U.S. Census Bureau’s American Community Survey. The Center’s survey finds that while most STEM employees place at least some importance on racial and ethnic diversity in the workplace, blacks are far more likely to classify such diversity as extremely or very important: 84% say this, compared with 64% of Asians, 59% of Hispanics and 49% of whites. In addition, around six-in-ten black STEM employees (57%) say their workplace pays too little attention to increasing racial and ethnic diversity. 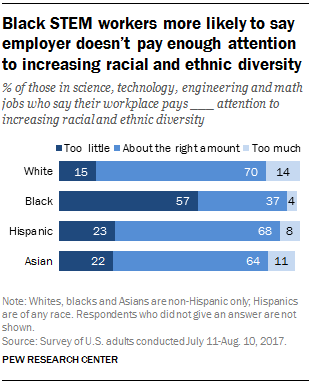 Most whites, Hispanics and Asians, by comparison, believe their employer pays about the right amount of attention to diversity. There is also wide disagreement on how much discrimination contributes to racial and ethnic disparities in the field. 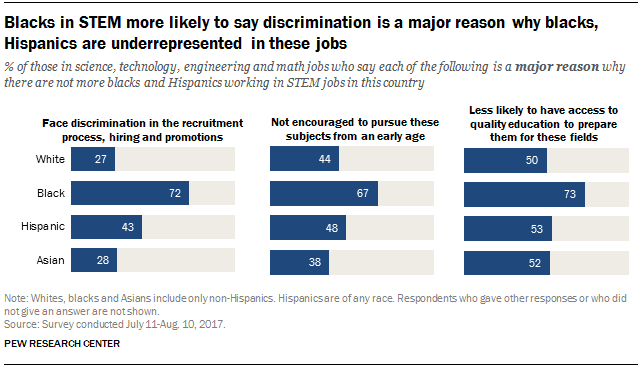 Among those in STEM jobs, 72% of blacks say a major reason blacks and Hispanics are underrepresented in these jobs is that they face discrimination in recruiting, hiring and promotions. That compares with 43% of Hispanics and around a quarter of whites and Asians (27% and 28%, respectively). Majorities of black STEM workers also see lack of access to a quality education or lack of encouragement at an early age to pursue these subjects as major reasons why there are fewer blacks and Hispanics working in STEM. But only around half or fewer of whites, Hispanics or Asians attribute underrepresentation to these education-related factors. One possible reason for differences in STEM representation may be related to the fact that black students are more likely to attend schools that do not have the infrastructure to offer advanced math or science courses, according to Cheryl Leggon, associate professor in the School of Public Policy at Georgia Institute of Technology. Leggon also says blacks in these fields may have experienced lack of access to top-quality education in high school or even earlier. So, why do views among blacks consistently stand out from those of other racial or ethnic groups working in STEM? Previous Pew Research Center surveys have found that blacks, in general, are more likely than other groups to say they’ve been discriminated against because of their race or ethnicity or to believe that blacks are treated less fairly than whites in the workplace. In the new survey, contrasting views about racial diversity are not limited to those who work in STEM. Among those employed in non-STEM jobs, blacks are substantially more likely than whites to say racial and ethnic diversity in the workplace is at least very important (78% vs. 44%) or to report that their workplace pays too little attention to increasing racial and ethnic diversity (43% vs. 14%). Still, on some measures, blacks who work in STEM do stand out from blacks who work in other fields. For example, blacks in STEM are more likely than blacks in non-STEM jobs to say they have been treated as if they were not competent (45% vs. 28%) or that they’ve felt isolated at work (29% vs. 16%) because of their race or ethnicity. Among blacks, those in STEM jobs are also more likely than non-STEM workers to say discrimination in recruiting, hiring and promotions are a major reason why blacks and Hispanics are underrepresented in STEM jobs (72% vs. 58%).